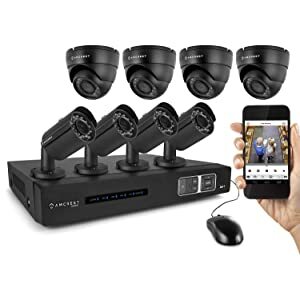 Amcrest 1080P HD Over Analog (HDCVI) 8CH Video Security System is a new age home and office security buddy that has brought into the market by Foscam, US. It allows CCTV cams to be placed all around the home or office, which can be controlled centrally by the system. It utilizes closed circuit design of HDCIV in the analog camera for real-time surveillance. The transmission is long range and also provides a secure closed network. It is hassle-free to set up and easy to use, employing the plug and play feature. It comes with a 1 year US warranty and has easy DIY installation. The system has excellent video quality of 1920 x 1080p (1920 tvl) at 30 fps with real time recording functions that enable the user to view the footage instantly. It also records in widescreen format; allowing easy viewing of recordings and has a quick access QR code that helps for remotely viewing the recording on iPhone, iPad, and Android devices which make the system very user-friendly and easy to manage. It also comes included with the Amcrest View app. The recordings shall be in digital format; and images from different cameras are recorded at a centrally controlled unit by seamless integration. This technology helps to manage the recording without any complication and also ease up the checking of images. The camera transmits uncompressed signals by HD-CIV and as a result the latency in getting the signal never happens. It comes with a pre-installed Hard Disk Drive (HDD), and it can perform continuous high-resolution recording for 360hrs. The cameras as IP66, which are Indoor and Outdoor weatherproof and have a compelling IR-LED vision, making night time recording clear too. It can do long range transmission up to 984ft and also can run on a single coaxial cable. Also, it has a USB backup feature for saving recordings from important time frames. Excellent Video Quality: The system takes images with 1920 x 1080p resolution, is great video quality and also takes images with crystal clear quality. The 30fps image capturing ability is superb and can make facial recognition of intruders very easy. Real Time Video: The system has the facility of Real Time recording that makes it an excellent choice for anybody who constantly needs to monitor sensitive areas with high-security risks. The real-time imaging enables the security staff or personnel to capture intruders easily. Remote Viewing: For all those times, when the user is not at home or is just out for a little lunch or coffee break even, the areas with security risks still need monitoring and Amcrest 1080P provides a solution for that. It has a unique QR Code and after scanning into an iPhone; iPad or any Android device and the camera footage can be viewed remotely. So even if you’re away your desk, your home or office’s security is still in your hands! The cameras connect directly with the DVR for painless and simple plug –n-play set up. The DVR functions as a single control hub and makes the cameras simple to secure. To upgrade to HDCVI from predecessor technologies; the user simply has to switch out the camera units and DVR and keep the coaxial cabling from earlier set ups. Motion Detection and Alerts: The DVR can be used to customize motion alerts. We can set perimeter zones, specify active grids of camera motion and even set a 24×7 schedule for when the warning system is armed or disarmed. It also has options to avoid wind-related false alarms. It activates multiple security responses like sending an e-mail, triggering recording and turning on the DVR’s buzzer. 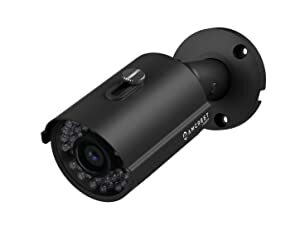 Weatherproof cameras: Rain or the sunshine, dust or dampness, these cameras are made of heavy duty metal and are engineered to perform in severe environmental conditions. The camera’s build quality guarantees the reliability of surveillance systems in all types of weather. The Amcrest 1080P can be used in residential areas like porches, backyards, patios, gardens, pools, bedrooms, garages, etc. Also, they can be used in business areas like car parks, courtyards, shipping bays, retail offices, warehouses, etc. Since it has high-quality video and real-time imaging, intruder recognition becomes very easy, making it a viable private security solution. Since it has easy set up with DIY instructions included, there’s no need to call upon specialized workers to set up the system. The cameras are heavy-duty and weatherproof, which make them usable round the clock and all over the year. Since it provides motion detection and intruder alerts, the security personnel can spend an hour or two away from the system without being stressed about missing anything important. Since it provides remote viewing, the user can have access to his/her home or office area even when they’re on a holiday, and this contributes to their peace of mind too. It comes with a pre-loaded HDD that can take up to 360 hours of continuous recording. This system price is slightly on the higher side and could have been a little more affordable. But, considering the features, the deal is worth the money. It also uses up a lot of Internet data and thus it is recommended to place it on a separate Internet network, rather than the same one used by home users. The product has 4.2 out of 5 stars on Amazon, a clear indication of its mass acceptability among its customers. Out of the total customers; 61% favored the surveillance system with 5 stars and another 21% supported the product with 4 stars. Overall, considering the customer feedback, Amcrest 1080P HD is a reliable product for quality and performance. The product has great quality and is also user-friendly. The price may be high, but you have to pay the price for quality. The product has got great reviews on Amazon and the quality of service by Foscam is also outstanding. The recording quality is superb and is an excellent surveillance solution for home and office level security. The product reviews clearly indicate its quality and compared to its competitors in the market; Amcrest 1080P HD indeed offers great quality and easy management. The product is versatile, can be used in all kinds of environments and also has considerable credibility. Amcrest offers prompt service as and when problems occur in the device and the 1 year US warranty guarantees free service and repairs too. Its alert feature comes in handy as it not only sets off alarms but also notifies the user via email that an intruder is trying to trespass the property. All in all, it is an excellent surveillance camera. Sounds good, we will add a section shortly! If you only ever get one system of cameras, get this one! I have been so impressed with Amcrest and I can not recommend them enough. With all the scares on the news I have become a paranoid mess and just having these cameras around the house has lowered my stress levels by a lot. Even my wife said I am happier now. For someone like me who needs to watch their budget, this was not an option. I have to wait or settle for something more affordable. I do plan on getting these eventually but for the time being I will have to continue researching other cheaper options. The only downside for these Amcrest cameras is the price.